Right on cue, teenager Kieran Kay has found his passion in life. The Senior 3 Gracemount High School pupil, who is autistic and has learning difficulties, has made quite an impression on the snooker and pool circuit since first picking up a cue in December 2016. Although he had potted the odd ball with brothers Bradley and Daniel – who are also keen players – it wasn’t until a video of the youngster “clearing up” was posted on Facebook that life began to change for the then 12-year-old. Now 14, Kieran is representing his country in both disciplines and has won numerous competitions, at both national and international level, as he continues his rise in the sports. 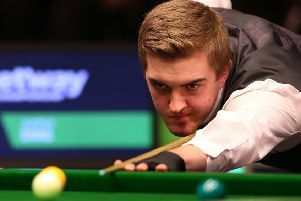 His proud mum, Sharon, says his passion for the game has really brought her son out of his shell, where he now has his heart set on carving out a career as a professional snooker player. Given Kieran had shown little interest for either sport prior to 2016, his progression is quite remarkable. He started playing pool first only to take up snooker just two months later. “I think he was tempted into it by the fact his older brothers played and that’s why he decided to give it a go,” Sharon says. “He started playing pool in December 2016 and then snooker two months later. He’d played a wee bit before but that was more about just hitting the balls. My brother just happened to capture him potting some balls on his phone and he put it up on Facebook and he was getting people asking, ‘who is this wee guy? That was brilliant’. And it just kind of went from there. “He started attending a pool academy in Dalkeith and Falkirk and someone mentioned there was a Paul Hunter Memorial Trophy competition for snooker, so Kieran there and then decided he wanted to win it. He went along to play and he did. “He got called up to play for Scotland for pool just a month after taking it up. He did really well and got picked for the European Championships that year where the B team finished third. But this year the they actually won the competition. Kieran will have the opportunity to put down a marker in the junior snooker circuit when he heads to Malta in January to compete at the European Open. “He won the Dumfries Junior Open in February and he also won the Glasgow Open last month so he’s doing well on the snooker front too,” Sharon said. “He’s kept busy that’s for sure. My life has always revolved around Kieran as he’s always been that wee bit different from a young age, but nine times out of ten me and his dad will go to every tournament and sometimes his brothers come along to support him too. “You see all the other kids who get the recognition so Kieran deserves it. I just think he’s been amazing as it has completely changed his life. It’s really busy now for us all.